Myal will come to your school accompanied by Peg the drummer. They are self contained and can portray travelling players from the 15th or 16th centuries, or even be year specific, allowing discussion of the whole Tudor dynasty, from Henry VII’s War of the Roses, Henry VIII and his many wives, the religious turmoil through the reigns of Edward and Mary, up to the era’s climax in the defeat of the Spanish Armada under Elizabeth . Travelling players would have seen a great spectrum of life, from the lives of the poor to the great Banquets of the gentry and even (if their luck was in) the Royal Court. There is so much that can be covered in a half day or day in school. Obviously as travelling players you would expect some music and dance (both gentry and country folk) to be provided, maybe the opportunity to try and play the instruments too or perhaps a play or some other form of entertainment. But in addition to this there are many, many areas that can be explored. Here are a few examples of what could be included but this is by no means all and content can be tailored to an individual school's requirements. So a few suggestions; clothing (they come with a complete outfit for both a boy and a girl to dress up in), etiquette, food and drink, exploration (Myal won a map in a game of cards. . with a sea captain. . . honest!! ), crafts (felt hat making, dyeing, leather, instrument string making), warfare, the monarchs, their wives, the husband, the Virgin Queen, religious and social unrest, another split with Europe, meaning Rome, of course. . . . They are happy to "run" with whatever is "firing the children up" and are steeped in the Tudor way of life to the extent that they are happy to answer questions on pretty much anything. 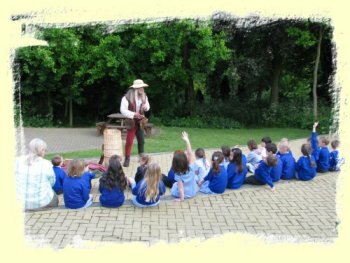 In fact, they find that once the children have danced and become more comfortable with their visitors, the question and answer sessions can be particularly interesting and lively. 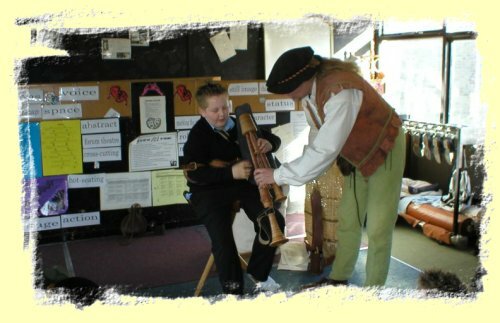 Dressed in full and authentic costume they use some Tudor speech (re-enforced with modern English where necessary) and encourages the children to do likewise in order to help create a greater sense of atmosphere. Fashion varied a great deal through the 15th and 16th centuries so, Myal and Peg can come dressed appropriately for the period you are mainly studying. If you are particularly interested in the end of the War of The Roses (1480s), The Field of the Cloth of Gold (1520) or the Spanish Armada (1588) Contact them before hand and they will dress in clothes from that period. Having children dressed in costume also is worthwhile, even if it is as little as having their heads covered with a hat or coif (a covered head is a very visible difference between modern and Tudor times). This can all help to challenge and inspire the children, helping them to remember and learn. Myal and Peg carry everything they need to survive in their Tudor life upon their back and in their hands; from the bagpipes and drum used to make music for people to dance to, to the tinder box they use to make a fire to cook over and keep warm, from their great cloaks to sleep within and keep everything dry(ish), to the cooking pot. 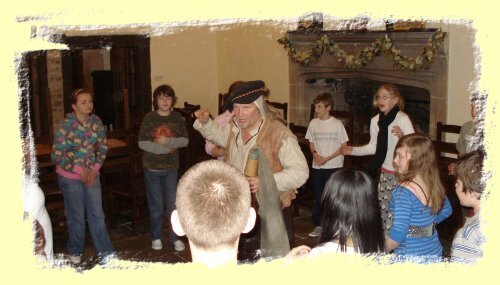 All enable the children to enter a real Tudor world. Myal and Peg have worked in schools, as part of their enrichment programme, where the children have done nothing but dance for the pleasure of dancing. These have been really well received even with 15 year olds who have arrived asking “why can’t we do something cool like street dance?” and left asking “can we come back at lunchtime and learn some more dances?” This is indeed enrichment.